You are buying Enfamil PFD Toddler Metabolic Powder Formula With DHA & ARA 1lb Each, Model #4759494. ADW Diabetes offers a complete line of Enfamil baby formula products both in liquid and powder form. We offer these items in both single and discounted bulk quantities for your convenience.Trust ADW Diabetes for your Enfamil baby formula needs as we offer excellent pricing and superior service. 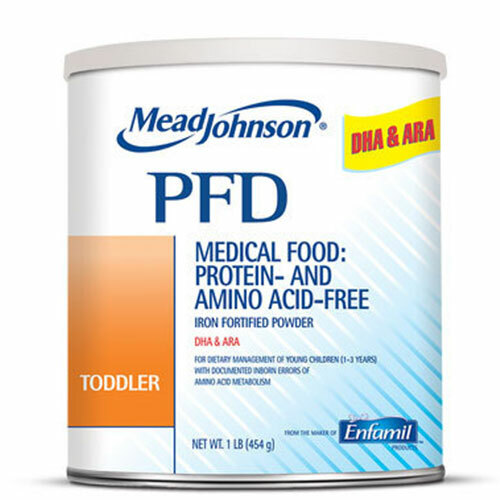 The Enfamil PFD Toddler Metabolic Powder Formula With DHA & ARA 1lb is a protein- and amino acid-free product designed with carbohydrates, vitamins, and minerals as well as the essential fatty acids for young children with various amino acid metabolic disorders. PFD Toddler is for persons requiring a protein-free diet. PFD Toddler can be used as a dietary supplement supplying calories, vitamins, and minerals, or specific amounts of amino acids or protein can be added to make a complete beverage. Increased levels of B vitamins for cofactor production. Increased level of choline, an essential nutrient important for brain development and the normal functioning of cells. PFD Toddler should only be used under the direct and continuing supervision of a doctor. Corn Syrup Solids, Vegetable Oil(Palm Olein Oil, coconut Oil, Soy Oil, High Oleic SUnflower Oil), Modified Corn Starch, Sugar, Calcium Phosphate, and Less Than 1%: Mortierella Alphina Oil(ARA), Crypthecodinium Cohnii Oil(DHA), Ethyl Vanillin, Sodium Citrate, Potassium Chloride, Potassium Citrate, Magnesium Oxide, Ferrous Sulfate, Zinc Sulfate, Cupric Sulfate, Manganese Sulfate, Sodium Iodide, Sodium Selenite, Chloride, Potassium Citrate, Magnesium Oxide, Ferrous Sulfate, Zinc Sulfate, Cupric Sulfate Manganese Sulfate Sodium Iodide, Sodium Selenite, Chloine Chloride, Inositol, Ascorbic Acid, Niacinamide, Calcium Pantothenate, Vitamin B6 Hydrochloride, Thiamin Hydrochloride, Riboflavin, Vitamin D3, Folic Acid, Biotin, Vitamin K1, Vitamin E Acetate, Vitamin A Palmitate, Vitamin B12, Taurine, L-Carnitine. *Warning: This Product is Nutritionally incomplete since it does not contain any protein or amino acids.